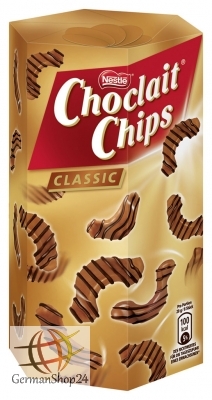 Slight crunchy flakes covered with fine milk chocolate and refined with decorative strips of dark chocolate - this enjoyment only offer the popular Choclait Chips Classic. In the popular hexagonal folding box with freshness sealed bag is just waiting to be nibble from you! Store in a cool and dry place, because not heat resistant. 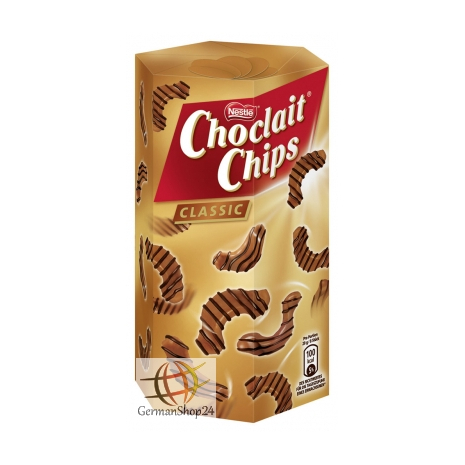 Sugar, corn meal, cocoa mass, cocoa butter, SKIMMED MILK POWDER, starch, palm fat, cocoa powder, WHEY PRODUCTS, BUTTERFAT, emulsifier sunflower lecithins, natural vanilla flavor, salt. May contain traces of nuts and gluten-containing cereal. Zucker, Maisgrieß, Kakaomasse, Kakaobutter, MAGERMILCHPULVER, Stärke, Palmfett, Kakaopulver, MOLKENERZEUGNIS, BUTTERREINFETT, Emulgator Sonnenblumenlecithine, natürliches Vanillearoma, Salz. Kann Spuren von Nüssen und glutenhaltigem Getreide enthalten.